Each year at Christmas, presents come quick! With Santa Snailien helping Old Saint Nick! 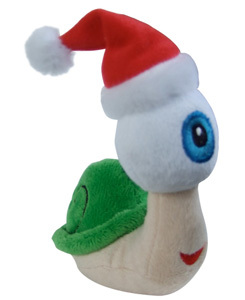 Santa Snailien is a racing snail from outer space. Like all Snailien, he's a fast racer but an even faster friend. He doesn't really care who wins - as long as he wins sometimes. If you want to be his friend, great! Just make sure you wash any salt off your fingers before shaking hands. His favorite food is sidewalk. On Santa Snailien's home planet, sidewalk comes in many flavors: gravel-berry, dirt-merengue and his personal favorite, pebble pie! For a special treat, share a big bowl of pavement and cream with your new friend, Santa Snailien!